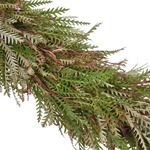 Add textural interest to your event with Grevillea Garland. Grevillea has a jagged appearance with small leaves that resemble barbs covering red stems. The leaves range in color from vibrant green to rich red. Ideal for seasonal autumn-inspired events. Use this garland alone, or wire in blooms like creamy white spray bulk roses, protea yellow pin cushion flowers, and yellow tinted rice flower. Garlands with a length of 50 ft and above will come in sections of 25 ft.
We do not recommend cutting the garlands, this could result in unraveling or weakening of the structure of the garland. Garlands last an average of 4 days, depending on care and handling. 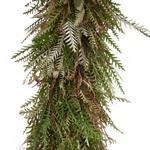 Since greenery is a product of Mother Nature and due to variation in monitor resolutions, the exact color tones of this garland may vary to some degree. 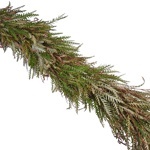 Bulk Garlands are shipped directly from our garland greenery farm. Simply follow the steps below to keep your garlands fresh. Keep the garlands in the box with the lid on and store them in a cool dry place, away from direct sunlight, drafts or excessive heat. As long as they are in a cool place, there is no need to store them in the refrigerator. After removing the garland from the box to begin decorating, you can mist with water to keep it looking fresh longer. It is normal for the garland to shed.